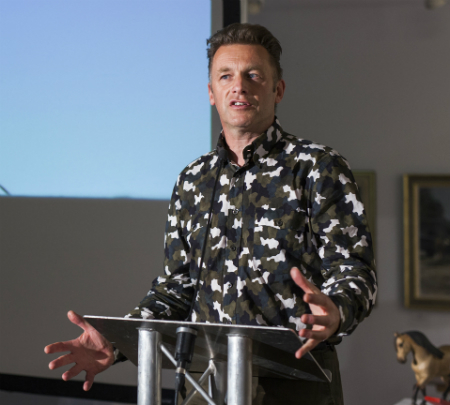 Multi-award winning Chris Packham is one of this country’s most exciting and respected TV naturalists and conservationists. With his love and knowledge of the natural world and his profile as a television presenter of groundbreaking series, he has become a sought after and highly entertaining speaker. Chris is co-presenter of Springwatch, Autumnwatch & Winterwatch (BBC Two). Since his first appearance on The Really Wild Show (BBC) he has rarely been off our screens. His most recent series include Inside the Animal Mind (BBC); Nature’s Weirdest (BBC), The Burrowers (BBC), Secrets of our Living Planet (BBC). He was also one of a team of scientists and filmmakers who spent five weeks in the Arctic documenting the life-cycle of icebergs for the cutting edge BBC/Discovery series Operation Iceberg. Chris described the iceberg as “radiating an irresistible terror”. Chris is recognised for his perceptive and outspoken views on conservation and his absolute passion for wildlife. He is an award winning wildlife photographer, a modern art collector and author. He is president, vice-president, patron and supporter of many charities.